What do you do when not only are you and your brother avid BJJ players but are also involved in the family business of fabric and fashion design? Easy, peezy start a new gi company of course. Kaden of Mueawear has promised to deliver simple and functional gis that will continue to be pleasing to both the eye and the body. Founded earlier this year in Seoul Korea, Muae currently offers only a single limited edition gi, the Oniwakamaru, but plans are in place for more gis as well as a full line of fightwear and clothing. The Oniwakamaru features stunning interior artwork that is printed directly on the inside of the gi. This kimono comes with all the features you’d expect from a high-end gi and few you may not have seen before such as ripstop lining in the lower half of the gi. High-quality construction and excellent customer service combine to make this an attractive gi. The kimono top is made from 560g/m² single weave. The loop of the weave and the heaviness of the fabric make if feel more like a double weave. The gi pants are made of 320g/m² twill with reinforced knees. The pants are quite a bit heavier than most gi pants and feel like canvas. The seams are well constructed throughout, with high quality embroidery and no loose threads or seams. The stress points were all made with triple stitching and there is extra reinforcement at the armpits and the slits of the skirts. Additionally, there is cloth tape covering the seams at the cuffs (pants and arms) and the skirt of the kimono for added comfort. Within the gi is a beautifully rendered illustration inspired by a traditional Japanese drawing of a warrior and koi from the Edo period (1603-1868). By now you’ve seen pictures of the interior illustration of the gi. It really does look that nice when it is in your hands and while there was a little fading after washing it still looks great. Quick PSA, I’d highly recommend washing this gi in white vinegar prior to using to help the color set. The embroidery is very well done on the kimono, particularly on the lettering of the right sleeve. 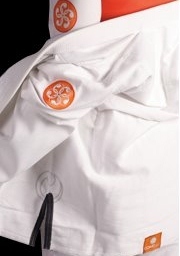 The right sleeve has “Jiujitsu For Soul” embroidered on it in flowing copperplate script, the base of the collar has a small patch, the name of gi on embroidered on the skirt and finally the left sleeve has “Muae Jiu Jitsu Kimonos” and a lotus on it. There is a patch at the base of the neck that had a little bit of over-stitching. I always look at the wingspan of my gis and unfortunately for me this A4 was on the lower end of the spectrum. If you are in the 5’10” to 6’2” range for height this probably won’t be an issue. Sadly, I haven’t been that height in about twenty years and my arms are somewhat long for my height anyway (I have an 80 inch wingspan from tip to tip). The cuffs of the sleeves are fitted and not overly baggy. The collar of the gi is very stiff and thick, similar to Bull Terrier’s Super Gold. There is ripstop lining on each sleeves from just above the elbows to the cuffs, which is something that I’ve not seen before. The owner of Muae has said that he did this to minimize any stretching of the sleeves. A bit of surprise to me was that the kimono barely shrunk at all after washing it on hot and drying it for 30 minutes. As a single weave I was expecting to see some significant shrinkage but the materials used must have been pre-shrunk significantly. As mentioned earlier the pants are 320g/m² twill with reinforced knees. The feel is much like heavy canvas. The reinforced knees are probably too short but with the durability of the fabric used I’m not sure that this will actually make too much of a difference in durability. The pants themselves have a few nice patches and embroidery. The company logo and a small kanji patch are on each side of the pants and there is some additional embroidery identifying the gi itself. As before the stitching of the patches and embroidery is well done. The pants barely shrank at all after washing and drying and their length and cut are pretty typical of most A4s that I’ve worn before. There are two things that I would definitely change if possible on the pants. I’d really like to see at least 4 loops on the pants and I’d also like to have the option of a cord instead of the flat cloth drawstring. Unfortunately the gi is a bit baggy and the arms are a little too short for me (I’m 6”4” and 190lb) but the A4 did fit two of my training partners very well. The first was my instructor Ezra Lenon (5’10” and 195lb) and the other is a training partner Tony (6’2” and 225lb). The gi fit both of them well, particularly Tony were it seemed almost to be custom fit. Ezra was kind enough to test the gi out for me and enjoyed the fit and feel of the gi. He didn’t notice any difference in feel with the interior artwork and while he noticed the ripstop lining in the sleeves didn’t comment on it one way of the other. Kris Shaw was also able to give us a run down on the gi from a woman’s perspective. She got an A2 and wore it over the weekend at Girls in Gis. Kris mentioned that the A2 pants were fit her very well (she’s 5’8”) and that for a woman the A2 top was more of a slim fit and that the overall fit of the gi was excellent. The pants were a little heavier than her normal training pants and they weren’t the easiest to get tightened. Kris’ experience with the gi seems to match another female reviewer, Hannah Zeciri. I’ll start with the price which is currently $229.00 USD. While this is definitely in the premium gi price range and will limit its appeal to several athletes there are a few things that are included in the base price that you don’t typically see. The biggest draw is express shipping, mine took 3 days to get to me, which is included in that price to anywhere in the world. As someone who’s paid over $50 to have a belt shipped from Japan I can see why this could be a significant draw for those of you that regularly pay for international shipping. This gi is also constructed in China, the vast majority of gis are made in Pakistan, and that is factored into the final price. Finally and most obviously, is the interior illustration and overall quality of construction. Now to address the koi that seems to be swimming downstream. A common comment that I’ve seen on FB is that a downstream swimming koi is bad luck. While this may be the case in some illustrations, it does not apply when the overall image is taken into context. The two characteristics that are most important is the color of the koi, black, and that the warrior is defeating it. The symbolism changes when combined with the downstream koi to signify that the warrior has faced pain and diversity and thru perseverance he has overcome it. This is definitely a cliffs-notes version of everything involved in the use of koi in Eastern Art and if you interested in learning more about Koi in art check here and remember Google is your friend. This really is a skillfully constructed and beautifully illustrated kimono. 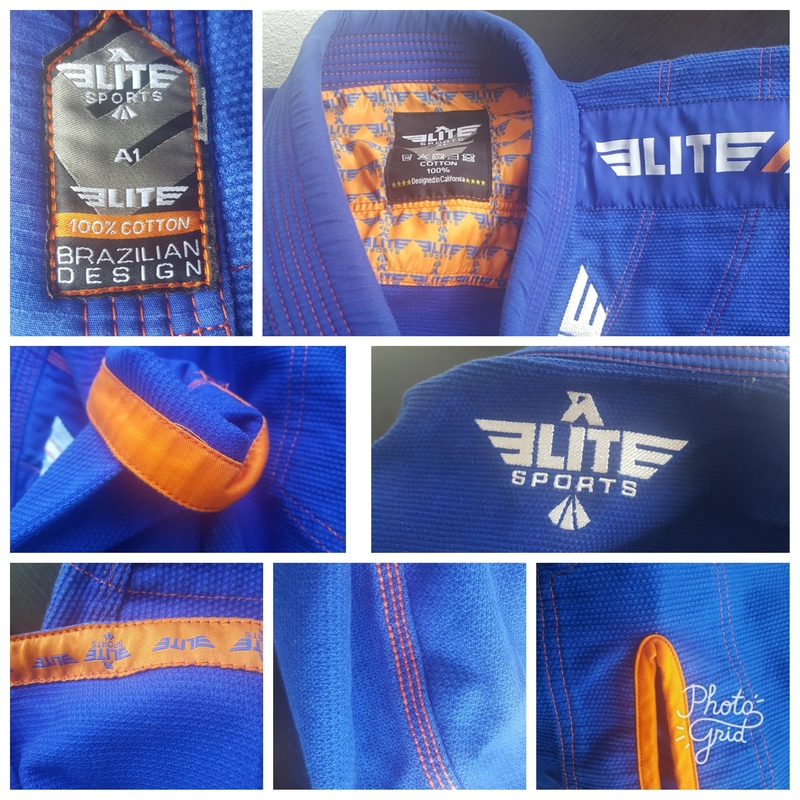 The interior artwork will satisfy the need for bling in anyone and with the added bonus that while it’s being worn your gi is minimally adorned with top notch embroidery and a few patches. Sadly, this gi isn’t constructed for someone as tall and lanky guy as me. As I mentioned earlier, one of my training partners tried it on, he’s 6’2” and 225lb, and it fit him like a glove and Ezra really liked the fit as well. For someone in that size range this is a great gi. Based on the feedback from the two women that have used it this gi also fit them very well and would be a good option for those ladies out there with similar builds. Don’t forget to check out the image gallery below for a lot more pictures. If you’re interested in purchasing the gi please contact Kaden directly at his FB where he also posts product updates and the occasional sale.